I started by using Maybelline’s 24hr Colour Tattoo eyeshadow in 40 – ‘Permanent Taupe’ as my base all over the lid and up to the crease. I also used my finger to lightly place some along the lower lashes. Using the Naked palette by Urban Decay I used a flat stiff brush to pat ‘Sidecar’ on top of this on the lid. Next I used a fluffly dome brush to blend ‘Toasted’ into my crease and on the outer part of my lower lashes. I then took a smaller stiff dome brush to darken the outer corners with ‘Hustle’. I then used Stila’s Convertable Eye Colour in ‘Berry’ as a liner along my top and bottom lashes and finished with a coat of Lancome’s Hynose Drama mascara. I blended MAC’s ‘Tenderling blusher along my cheekbones and up towards my temples. The eyes are the focus here so I kept the lips fairly neutral with just a swipe of Barry M’s lipgloss in number 2. This is an eyeshadow primer available in four different shades that effectively prevents eyeshadows from creasing on the lid. There’s quite a bit to be said about this eyeshadow primer. I’ve been using this for several years now and it’s a lifesaver! This is perfect for those of you with oily lids whose shadow disappears after a couple of hours or just for preventing that annoying eyeshadow line that appears in the crease and messes up our wonderfully executed smokey eye! There are four shades to choose from: Eden, Greed, Original and Sin. These shades all glide smoothly over the lid and have a lovely velvety texture. I find the best way to apply this product is with a fingertip but if you prefer then a flat shadow brush would work just as well, just remember, this product goes a long way so you only need a very small amount! This product really is a must have for make up lovers as it really does keep eyeshadows on all day and night, it has enabled my shadow to last even through an exercise session! I love this stuff! At £14.50 this product may seem a little expensive but a tube of this stuff will last you a very long time and keep your eyeshadow perfectly in place all day and night. Well worth the money! 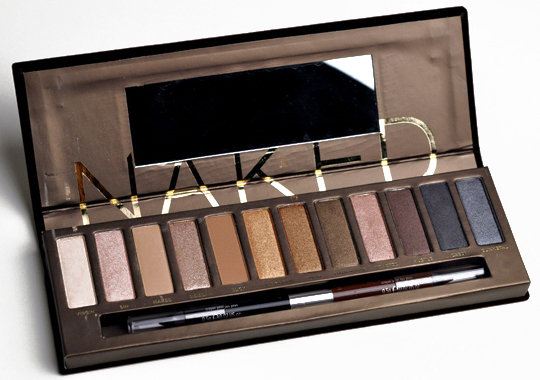 A gorgeous palette containing 12 neautral eyeshadows by Urban Decay. This is a palette every make up fanatic needs (well – this or the Naked 2 palette – or both 😉 ). It’s full of a wide variety of neutral shades, both shimmery and matte and none of the usual chunky glitter that you run the risk of getting with some Urban Decay shadows. The shadows go on smoothly and blend very well. This palette is perfect as a gift or for your average make up junkie and there are shades for a very natural look, summery bronze shades and of course some spectacular smokey ones too. Personally I feel like this palette is quite pricey (it’s £36 – ouch!) but because of the quality of the shadows I would still say it’s definitely a good investment as there are a huge variety of looks that can be done with these colours.